Many have asked for a web interface to administer their EON ZFS storage. I started a FreeNAS interface port a while back but time and keeping pace with their development proved unsustainable. I shared it in the download section as Freon for someone with better PHP resources to complete. I also posted a webmin howto a while back. The webmin web user admin, lacks only a ZFS and a CIFS module. It contains a Samba module which may be easy for one of you Perl guru's out there to extend as a CIFS module. And that's pretty much it. We point the browser to http://EON_ZFS_IP/cgi-bin/napp-it/admin.pl and you should be greeted by a login with no password, which you can immediately change. It is very configurable and I really liked the console command feature. So give it a try and help improve it. thank for giving napp-it a try. i'm not an experienced solaris user but i will see how i can install the missing CGI::Carp module (or did anybody know how). Its not necessary to run but its important for users who want to change or edit menue items because it will display script errors in your browser window and not only in apache error log (together with a error 500 message). 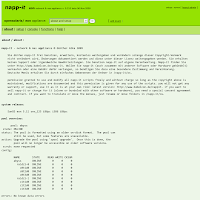 napp-it is then copy and run (my preferred way for applications). copy it to your webserver's cgi-bin folder and make it and content rwx for all (use winscp recursive). thats all to install and run. if have also tried new beta 0.212 on eon. scriptable auto-job seems to work. maybee you could include this module in eon. if you also enable root access via ssh per default, it will be possible to work with eon via winscp and putty for those without solaris and unix knowledge and without vi (this Very Inhuman thing, i hate it, every time i must use it and had to remember how to use it). napp-it should not only be a cgi-application but a concept of a complete basic ready to run server for common use and with usability in mind. apache + cgi application napp-it need root permission to manage eon via pfexec. maybee you or anybody else have an idea how to setup opensolaris. at the moment, my suggested setting is to open everything for the apache user account without password. only acceptable in home and closed networks without ssh. This is, on the whole, a brilliant combination, and has the potential to make the technology much more accessible to people like me, who are barely getting to know OpenSolaris and ZFS. I knew basically nothing a week ago, and am still trying to get everything to work. I think the most important feature, for me at least, is that the graphical interface gives you a lot more information without having to learn a lot of the OpenSolaris jargon-commands, which I define as commands that have equivalents in other operating systems, but don't have any additional major functionality. One example for me would be pfexec vs. sudo on linux; one has to keep track of two different commands, but for the same purpose. It not only wastes time and energy, but makes for an unnecessarily steep learning curve for newbies like me. Just to list which services are running, and then activate/deactivate them requires piling through tons of webpages and/or documentation---and you don't really learn anything new. So napp-it is a HUGE help in this area. In fact, I realized that there was no NFS running on my EON install, so hours spent trying to troubleshoot why NFS wasn't working obviously were in vain (more on this later!). 1. Download the ZIP file napp-it-0.210.zip from the website linked in the post. 2. Copy it to an empty working directory of your choice (e.g. /tmp on your regular system). Unzip it on a Linux system (I'm using Ubuntu 9.10), from the command line, using "unzip -aa /tmp/napp-it-0.210.zip". If you just use the default Archive Manager in Ubuntu, and extract the directory, you'll get some funny "^M" characters at the line breaks. 3. Make your life easy, and edit the admin.pl file, as in the post, with your favorite editor, to comment out the single line. I never use vi, and it took forever to figure out how to make those changes when I did it on the EON system; since you have to copy files, there's no reason for the extra hassle. 4. 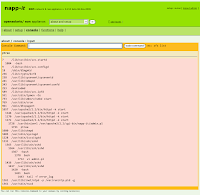 Now, you have a complete directory structure with all of the files for napp-it. There are several ways to handle it from here. My way was to copy the files to a place on the zpool that I created. Why? because I can't (yet) get the USB stick to work, so I have to reboot off of the LiveCD every time. There's some errors for me, and in the meantime I want to get the system up and running, and will then worry about the USB stick. So I have to put the files in the actual disk-based storage, or it won't be there the next time I reboot. I used secure copy (scp), since that's the only thing that works; I can't get SMB to work properly with Ubuntu, which isn't much of a surprise, and there is no NFS service running on my CD of EON (again, see below). Fortunately, the ssh/scp always works, if slowly. So I copy the entire napp-it directory, with the modified admin.pl file, to a new directory. 5b. The "chown" command changes ownership from root (assuming that's what you logged in as to do all of this administration), so that the webserver has the right permissions. 5c. Finally, the "chmod" command gives everyone the correct access (Andre says 755, Guenther says 777 in his online help; I suppose it doesn't matter too much). argc is 0. argv is . This is very helpful in demonstrating that your apache server is working (you can also go to http://EON_ZFS_IP/ and see the message "It works!". If either of those messages fail to appear, then you know there's something wrong with the http connection to the EON box. Okay, that was really kind of long, but basically it's a complete, self-contained set of instructions that will work, based only on what comes by default on the latest EON iso image, and the download from napp-it. My personal opinion is that it would be quite valuble to include a version of napp-it with the next release of EON, though of course that depends on a number of other factors. But the reason that it's so useful is that it tells you what is running and what is not, and this is a huge help in troubleshooting for beginners. If it's auto-configured properly, anyone can just point their web browser, and immediately know that the EON box is working, that it's talking to the right machines, that ZFS is working, etc. etc. etc. This would be a HUGE improvement in usability and robustness. A final word: for those of us who are starting with OpenSolaris, it's not at all obvious to figure out what's installed with EON, vs. the standard (and obviously much larger) default OpenSolaris installation. In particular, the "unzip" programs in this post were not included. Much more importantly, I don't see NFS/server when I run "svcs". And when I type "svcadm enable nfs/server", as every web page on the subject tells me to, I get "svcadm: Pattern 'nfs/server' doesn't match any instances. If I understand correctly, that means that NFS isn't installed or running on the standard EON iso image? I think this needs to be fixed, or at least indicated. I've spent many hours trying to figure this out (I still don't know how to install packages on EON, either). It would be very good if the next version of the software would include this, and some instructions for us newbies on how to get it. Until then, I can't really make use of my EON box, since there's nothing by ultra-slow SSH allowing me to move data around. I hope I'm just missing something really trivial and obvious, so I can get up and running fast. Thanks! Thanks for your instructions. You are correct unzip is not in the base image. Sorry, I didn't make it clear that it was being used from the binary kit. chmod 777 (world writable) may have some security concerns, hence I opted to 755. How do I start NFS server services? How do I start NFS client services? Brilliant. This is just brilliant. Fortunately, everything is now working just fine, and I'm getting nearly 60 MB/sec over standard gigabit ethernet, to a Dell Optiplex 620 (single-core 3 GHz P4 with 2.5 GB of RAM) with a single 750 GB SATA Hitachi drive that's several years old. This is amazing! What makes EON so unbelievably effective is that you can literally dig an older computer out of the closet, plug in some random drives, and get better performance (with compression, CRC error checking, and lots of inherent duplication) than ANY of the regularly available commercial NAS units. Has anyone used this with teamed ethernet (link aggregation), and seen a noticeable improvement in performance? Any hard numbers? After I got NFS working with your instructions, the filesystem I wanted was available over NFS---even though I had (accidentally) set sharenfs=no for that filesystem. Why then does NFS still work? I'm really confused. @Peter: Binary kit instructions here..
we all know, that opensolaris does not support as much hardware than windows or linux. the opensolaris hcl is not really helpful, if you are looking for a hardware without too much problems. in my case, i was looking for a current medium-priced micro-atx server mainboard, suitable for basic - up to high-power vmware and storage needs that should be under 500,-- euro together with quadcore xeon cpu and 2GB RAM. discover any problems with it, please tell me. The dependencies for the SMC web gui are fairly large. So right now there are no plans to integrate it. It might not be such a difficult exercise to add in the form of the binary kit but I do not have the bandwidth right now. It would be nice to get some feedback on how your intel 3420 micro atx board performs with EON. Looks like it should put down some awesome numbers. but eon should perform similar. but intels new low-cost server chipset 3420 especially on this nice and relativley cheap micro atx board seems to be really good server base. at the moment a can´t test it with eon (need it running) but i suppose it will run with opensolaris/ eon as well. i will tell you, if i have more infos. I get a "No thread specified" error when I follow your link. I would be interested take a look, if you can repost a working link. Thanks for the corrected link. Hey, I am running the snv_130 build 64bit and having issues getting napp-it to stay persistent after reboot. I get it all setup as per the instructions in the original post, test it out and its all working but then I run updimg.sh and reboot its gone. I have changed the account password at the same stage and that is persistent but not napp-it. It's probably my lack of understanding as far as this ram disk image stuff goes. Should I maybe be using the instructions to add drivers to the image instead? Hey Andre, AWESOME, I added /var/apache2/2.2/cgi-bin/* to .backup, ran updimg and rebooted, My napp-it interface is still there and ready to go. Thanks for the info, I take it this would be the way to get any addon files to be persistent? For anyone interested I have done up a barebones doco on how I setup EON with napp-it. You can get it here. This version uses sudo instead of pfexec. There are changes that needs to be done to alleviate this. Unfortunately, I can't find any reference on the admin.pl or admin-lib.pl to change the usage of sudo to pfexec. So, I just symlinked sudo with pfexec. And everything worked perfect! (well, so far). I haven't fully tested everything yet. Follow all previous instructions. Make sure that napp-it files are executable. For my installation, I installed napp-it on my zfspool and symlinked it on my apache cgi-bin directory. Make sure you cp all the CGI folder to /usr/perl5/5.8.4/lib/ directory. Also copy Carp.pm from the CGI folder to /usr/perl5/5.8.4/lib/ folder. The last thing should be to symlink /usr/bin/pfexec to /usr/bin/sudo. I'm pretty sure the same thing could be done when installing napp-it with the online installer. Just have to make sure sudo is mapped to pfexec. Also, add the proper entries in .backup for the CGI directory at /usr/perl5/5.8.4/lib, the Carp.pm and on .exec make your symlink for sudo to pfexec. I've managed to install napp-it 5 on top of EON (*solaris* appliance v. 0.500k nightly Jun.01.2011) using the online installer. I still have permission problems but seems to be it will work just fine. I can't find EON isos for download, ¿is this project dead or something? Poll: Do you use the EON binary kit? - Which version of EON do you use? 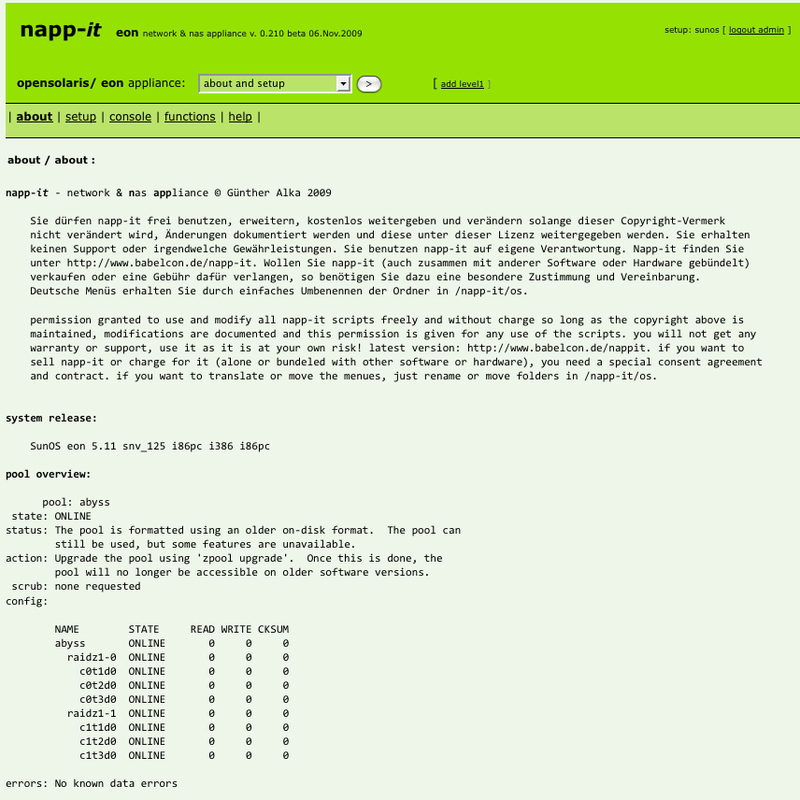 - napp-it v0.222 ZFS webgui released. - EON binary kit 130 released! How is EON ZFS storage working for you?